Hello! 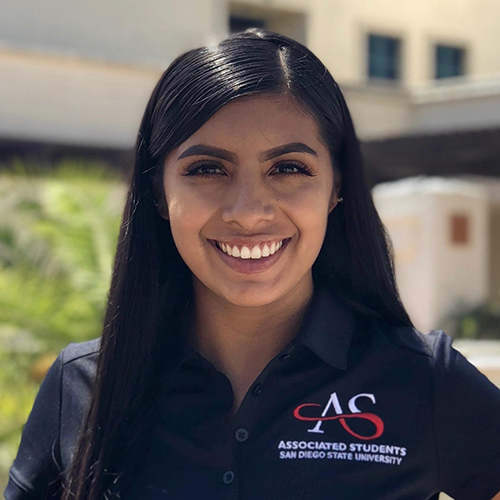 My name is Christina Alvarez and I am your College of Arts and Letters President for the 2018-2019 year. I am a senior majoring in Comparative International Studies with a minor in Spanish. I’m striving to serve in the Peace Corps to be proactive in the change I wish to see in this world. Dalai Lama said, “Just as ripples spread out when a single pebble is dropped into water, the actions of an individual can have far reaching effects.” Through this I only hope to inspire others to be apart of the movement of change, and make this world a better place for all to enjoy. I am also super passionate about being Vegan. I throughly enjoy geeking out with others about Veganism and sharing the unique lifestyle of a Vegan. I am not only a human rights advocate, but also an animal rights advocate. We all coexist in this beautiful universe together! On my spare time catch me working out at the ARC, reading inspirational quotes, discussing with others about life and our universal existence. 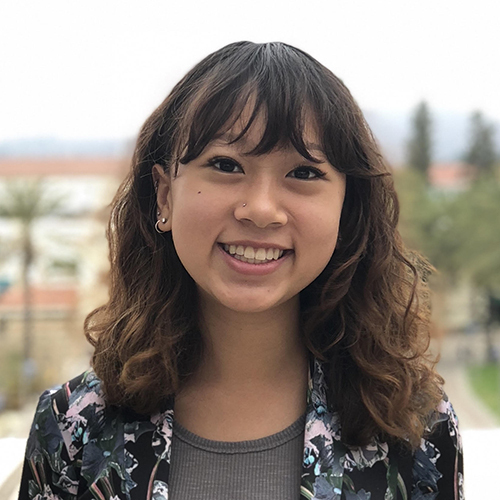 As your CAL President, I aspire to be a student leader that is mindful, approachable, reliable, and a resource that everyone feels welcome to come to. If you’re looking for a friend, a mentor, someone to answer your questions or discuses our existence on this planet, please don’t hesitate to reach out to me at the email link above. I am looking forward to a wonderful year of growth and new opportunities! I am ecstatic about all the new relationships that will flourish this year! Hello Everyone! 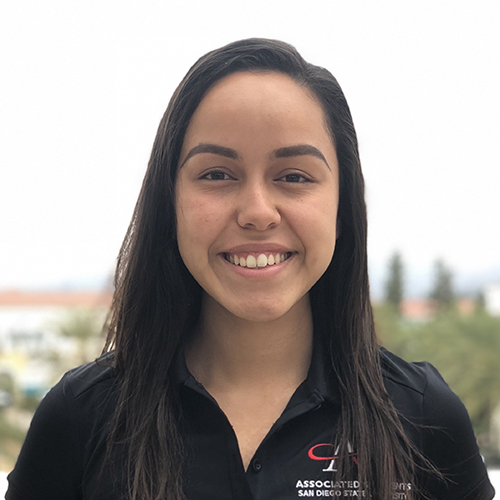 My name is Angie Espinoza, and I am excited to serve as your Executive Vice President! 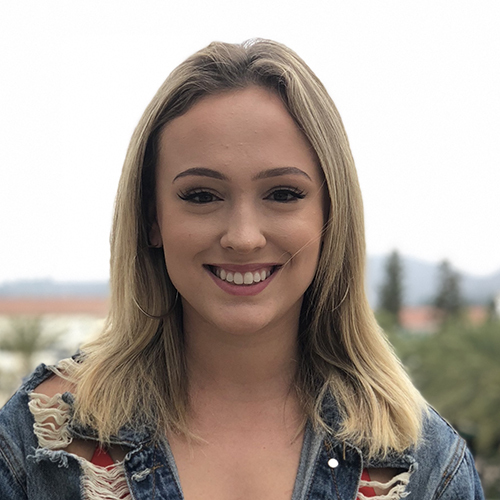 I am originally from San Diego and am currently a junior studying International Security and Conflict Resolution. I look forward to cultivating an empowering, safe, and engaging academic experience. 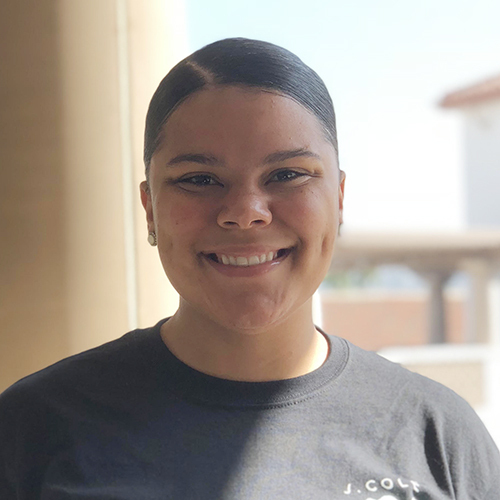 As your Executive Vice President, I am excited to meet with different organizations that fall under our college, host workshops that are led and for our students, and create a closer and more impactful CAL community. Outside of the College of Arts and Letters, you can find me working on service projects and community building in San Diego and Tijuana. My other leadership involvements include Associated Students, Rotaract of SDSU, and Dance Marathon at SDSU. I can't wait to meet you all and see the amazing things our college will accomplish this year! Hello future and present SDSU students! 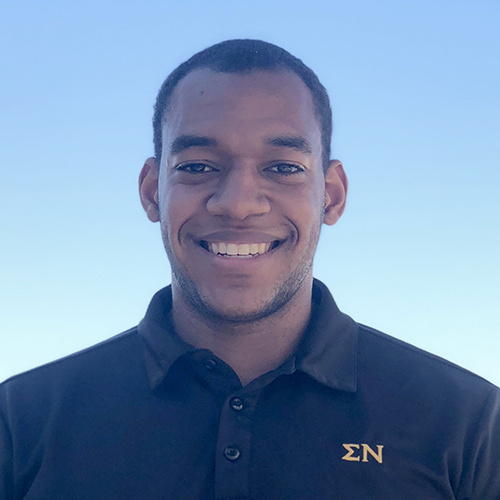 My name is Josh Murray, and I’m your College of Arts & Letters VP Finance. I’m a second year International Business student with an emphasis in Spanish & Western Europe. 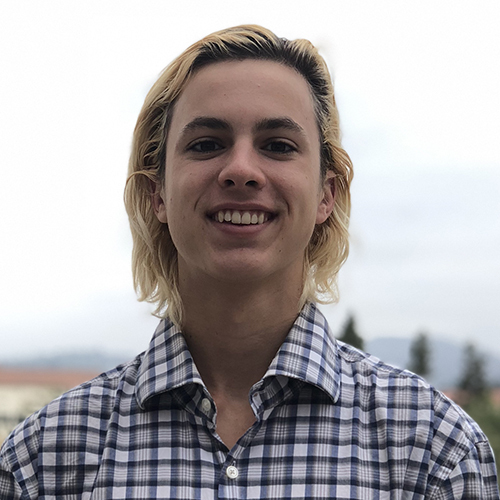 I grew up in Mission Viejo, and am looking to work in international finance after college. My hobbies include surfing, hiking, and music production. Music is definitely one of my biggest passions and my favorite artists include Hozier, Rezz, and Tchami. I am also a member and Scholarship Chair of the Sigma Alpha Epsilon fraternity. I joined CAL to help my community and make sure the finances of the College of Arts & Letters are well managed! I’m excited for the upcoming year and look forward to helping our CAL organizations receive the funding that they deserve! Feel free to contact me any time at the email link above. Hi all! My name is Britney Budiman and I am your College of Arts & Letters VP Publicity for the 2018-19 year! I’m a sophomore majoring in Urban Studies with a minor in Honors Interdisciplinary Studies. I am passionate about community building, storytelling as a medium for change, and racial representation in media. In my free time, I enjoy being stereotypically knowledgeable about boba, collecting fun socks, and thrifting t-shirts that I know I don’t need. Most weekdays, you can catch me on campus at the Center for Intercultural Relations in my role as a Diversity Peer Educator. As your CAL VP publicity, I strive to be as enthusiastic, reliable, and authentic as the mentors who led me to where I am today. Please do not hesitate to contact me at the email link above with anything you may need concerning marketing, flyers, information, and the likes. Looking forward to all the collaboration and relationships that will be realized throughout this academic year! Hello Everyone, My name is Kamil Robinson and I am your new Vice President of Internal Affairs for the 2018- 2019 year. I am 4th year Political Science and Criminal Justice Major with an emphasis in food studies (basically I eat whatever, whenever). When I am not engaged in school I am either interning at a political campaign, working at the Sheriff's Department or using someone’s Netflix! Some of my hobbies include trying new food, watching movies, studying history (particularly cultural history), volunteering and even engaging in political debates with some of my not to informed conservatives friends. As VP of Internal Affairs, I hope to become your voice for change, mentor, leader and friend. While at the same preserving the values and ethics that represent CAL. I came to this school with the passion to help others better than anyone has ever helped me and give back to a community that has given me so much. We are the future it is our opportunity to start the change right here in a community such as SDSU. There is power in the masses and I hope that you will join me on this wonderful journey! Overall, looking forward to meeting you all and hope everyone has an amazing first semester! If you have any questions feel free to reach out to me at the email link above. Hello CAL Students! My name is Stephanie Estrada, I am a third year International Security Conflict Resolution Major with a Spanish Minor. I am a proud Bay Area native, and Northern Californian girl at heart, I have always been passionate about working with diverse and marginalized communities throughout my professional career. I am a representation of my parents hard work, as a Latina and a first generation college student, giving back to my community is what facilitates my love for public service. I have volunteered at various non-profit organizations and political campaigns throughout the San Diego County area. 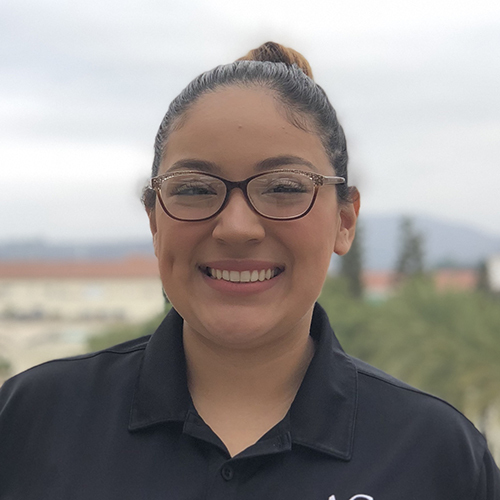 I am currently a member of the SDSU Rotaract Club, Vice President of Education Without Borders, employee of the Office of Registrar and your College of Arts & Letters Representative. In these leadership roles, I am dedicated to raising awareness about the importance of voting, creating opportunities for each student and your professional development. In the future, I hope to run for office so that I can support diverse communities and provide a pathway to the resources our world has to offer. Do not hesitate on contacting me if you’d like me to promote your club’s meetings/events or any other important announcements. As your College of Arts & Letters representative, I promise not only to be accountable for my actions, but also be your student advocate and a dear friend. Peace and blessings beautiful people! My name is Jada Johnson and I currently serve as one of your College of Arts and Letters representatives for the 2018-2019 year. I have been a talker my entire life so my major, Communication, came naturally when I arrived at SDSU. I later added a second major, Sociology, after discovering my passion for social justice. During my pastimes, I critically watch shows on Netflix and Hulu so that beyond entertainment I also note if diversity is accurately depicted if depicted at all. My favorite shows currently are “Game of Thrones,” “This Is Us,” and the all time classic “Grey’s Anatomy.” I enjoy watching “Ted Talks” and hanging out with my fur daughter Lexi. One day, I hope to teach the occupants of Wall Street how to love and be loved. I believe it is important for those who do not work on the social sector to understand our purpose in life is to do good unto people. Over time, this ideal has been lost. Loving those we serve is how we do the best good. Wall Street could use several lessons and I hope to be their teacher. Love is a philosophy I seek to carry with me throughout this term as a CAL Rep, I want to create a sense of transparency, authenticity, and empathy. If y’all have any questions, comments, concerns, compliments or if there is anything y’all need please feel free to contact me at the email link above. I would love to discuss some tangible ideas for programs I am interested in putting on! May your school years be prosperous and wholesome. Hey everyone! I’m Chloe Bycoskie, one of your College of Arts & Letters Representatives. I’m finishing up my fourth year studying political science and minoring in biology, hoping to one day become an environmental lawyer who helps protect our beautiful Earth. I proudly consider myself a huge animal lover, treehugger, and human rights advocate and do my absolute best to educate myself as well as others on related issues. As your CAL rep, I hope you all can utilize me as a resource and friend. Whether I can be a means of furthering your individual and/or collective goals under CAL, or simply someone to chitchat with over coffee about life, I’m there. You can reach me at the email link above, for anything, from just saying hello to proposing a brilliant idea. I’m beyond thrilled to play a role in this college and see what we can accomplish as one! Meetings: Weekly, Fridays 12-1pm, Council Chambers, Conrad Prebys Aztec Student Union.